View of Borgo Valsugana as seen from a higher panoramic viewpoint, with the campanile rising above the rooftops, a clump of trees on the right and mountain peaks in the background. Formerly known as Borgo di Val Saguna, it is a north-Italian town in the vicinity of Trento. 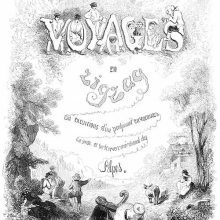 This illustration was originally sketched by Rodolphe Töpffer around 1832 and later re-drawn on wood by Karl Girardet. This workflow is typical of most of the illustrations for this book, with other artists specialized in landscape drawing, such as Charles-François Daubigny or François-Louis Français, sometimes taking over from Girardet. Töpffer’s failing eyesight made it necessary, as it didn’t allow him at this time to go through the more detailed and minute work of making a woodblock ready for engraving. The correspondence between Dubochet, his publisher and cousin, and Töpffer suggests this latter was satisfied with the result. … With a few exceptions, I find that your landscape prints engraved over there on wood from my autographied* sketches are lovely and do me honor, much more so than would poorer engraving from drawings on wood by me, be those drawings better than the sketches. * Autography is a particular lithographic process elaborated by Töpffer. Quoted in Kaenel, Philippe. Le métier d’illustrateur . Geneva: Droz, 2003, p. 263.